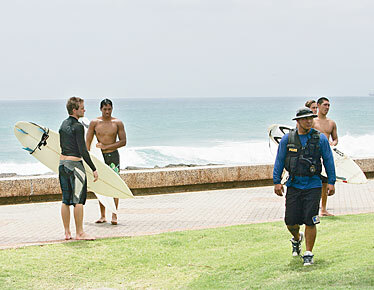 State Department of Land and Natural Resources officials enforced the "No Boards" rule yesterday at Point Panic near Kewalo Basin as bodysurfers rode the high surf. Surf is expected to be 6 to10 feet with higher sets today. 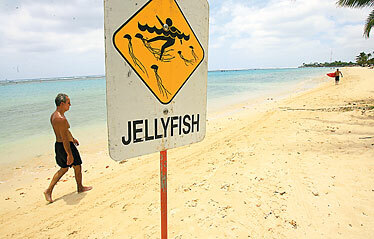 Warning signs went up at Ala Moana Beach yesterday as hundreds of box jellyfish invaded Oahu's south shores. Lifeguards said 38 people were stung at Ala Moana and Waikiki beaches.